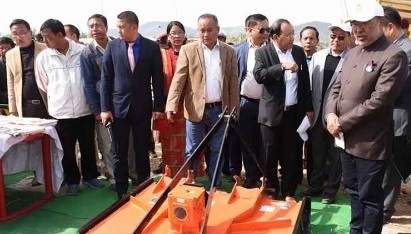 Manipur Chief Minister N Biren Singh on Sunday launched the ‘Rabi Campaign 2018’ at a hotel in Imphal East, a project aimed at facilitating the farmers to enhance their productivity and achieve higher yield of various crops during ensuing Rabi season. Addressing the gathering at the launch, the State Chief Minister said that the launching of Rabi campaign would have positive impact on the economy of the State. He also asserted that he would personally monitor the updates and improvement of the initiative every week, according to ifp.co.in. Biren further reiterated that the government, private agencies and farmers need to work collectively so as to increase the production of agricultural and allied products. The Chief Minister further disclosed that his government is mulling the idea of providing 100 per cent subsidy to those deserving farmers by providing loans and procurement of machinery adding that a new policy for the welfare of the farmers would be announced soon. He also asserted that his government is working tirelessly to uplift the lives of the people and to bring positive changes to the State. “It is the vision of Prime Minister Narendra Modi to double farmers’ income by 2022 in the country. Such initiative would definitely give a boost to the economy of the State, and also make the farmers self-reliant and self-sustained,” he added. Highlighting the huge talents and potentials of the people in every sector, Biren opined that if ‘we work with transparency, honesty and sincerity, Manipur would become one of the best states in the world’. He also disclosed that the present government has already implemented various welfare schemes for the people of the State. Highlighting that around 36 per cent of the population are below poverty line, he urged the government officials to work with transparency and sincerity so that these people get the benefits of various government schemes.